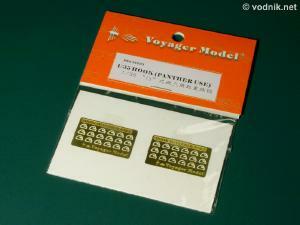 Lifting hooks set for WW2 German Panzerkampfwagen V Panther tank was a third 1/35 scale release by Voyager Models company from China. Just like previous two Voyager sets, PEA 35003 is also packed in a plastic bag and inside we get two small identical photoetched frets. In this case however no instruction sheet is provided. Lifting hooks themselves do not require any assembly (no base plates are given), as they were welded directly to engine cover armor plate of real Panther and should be glued to the model in similar way. Some instructions showing the placement of those hooks on the model would however be welcome - without them you need to use reference photos to make sure you attach them in correct positions. From the photos I saw it looks like in Dragon kits those hooks replace directly plastic parts - I'm not sure about other available 1/35 Panthers. One of two identical small PE frets included in the set. Photoetched parts are provided on two tiny identical brass frets, 20mm x 36mm each. Similarly to Voyager's PEA 35002 set, here also thicker then usual brass was used (0.25mm = 0.01"). 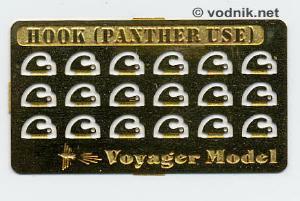 Some photos of real Panther I found, suggest however that those hooks attached to tank engine deck plate were rather thick and using two brass parts glued together would probably give more accurate results - this would give 0.5mm thick part, what translates to 17.5mm in real world size and seems to be about right, if not still a bit too thin. 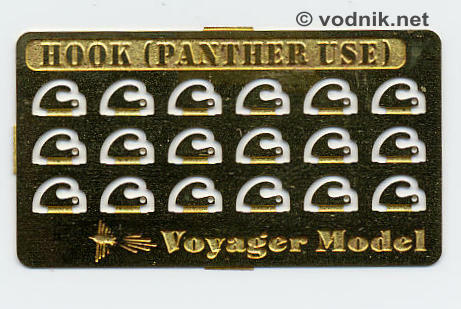 And you get 36 hooks in the set, while only four are needed for a single Panther tank, so even if you glue them in pairs, you still have enough parts for 4.5 model ;-) The same mentioned photos of real tanks also proved that the shape of Voyager parts is quite accurate. The Voyager set reviewed here is useful if you do not want to use any of large PE detail sets available on the market, but is also useful for those of you who plan to use Eduard sets (e.g. for Dragon model), as they do not include those hooks and you are supposed to use plastic kit parts. The set is rather cheap at $5 and you get enough hooks for several models. By the way, I'm not an expert on this field, but I believe exactly same hooks were also used on Jagdpanther tanks, so of course Voyager parts can also be used for models of those vehicles.